“When I film 84 UP, I’ll be 99!”—director Michael Apted. For half-a-century, ex-pat British director Michael Apted (Coal Miner’s Daughter, Gorillas in the Mist, The World Is Not Enough, The Chronicles of Narnia) has been passionately involved with the ground-breaking Granada TV project now known simply as The UP Series. Driven by the Jesuit maxim, “Give me the child until he is seven and I will give you the man,” the documentary series debuted in 1964 focusing on 14 British seven year olds—10 boys and four girls—from diverse socio-economic backgrounds. Fresh out of Cambridge University, Michael Apted initially joined the project as a researcher and corralled subjects who would ideally agree to be filmed again at seven-year intervals throughout their lives. It was a concept without precedent that has since produced eight films and, for better or worse, sowed the seeds of the “reality TV” movement as we know it. Fifty years later, the “children” are now 56 years old and, with one exception, still on board; and Apted subsequently directed the follow-up films: 7 Plus Seven, 21 UP, 28 UP, 35 UP, 42 UP, 49 UP, and the latest installment, 56 UP. As his middle-aged subjects reflect upon their current lives since 49 UP—whether divorced, single or long married, with their children grown, their grandchildren multiplying, their dreams realized, stalled or forgotten—this is a powerful reminder that our lives, like theirs, truly matter, that our days and weeks and years add up to something that can only be called “destiny”and that opportunities of class, gender and race and the definition of “success” and “failure” are ever-changing. 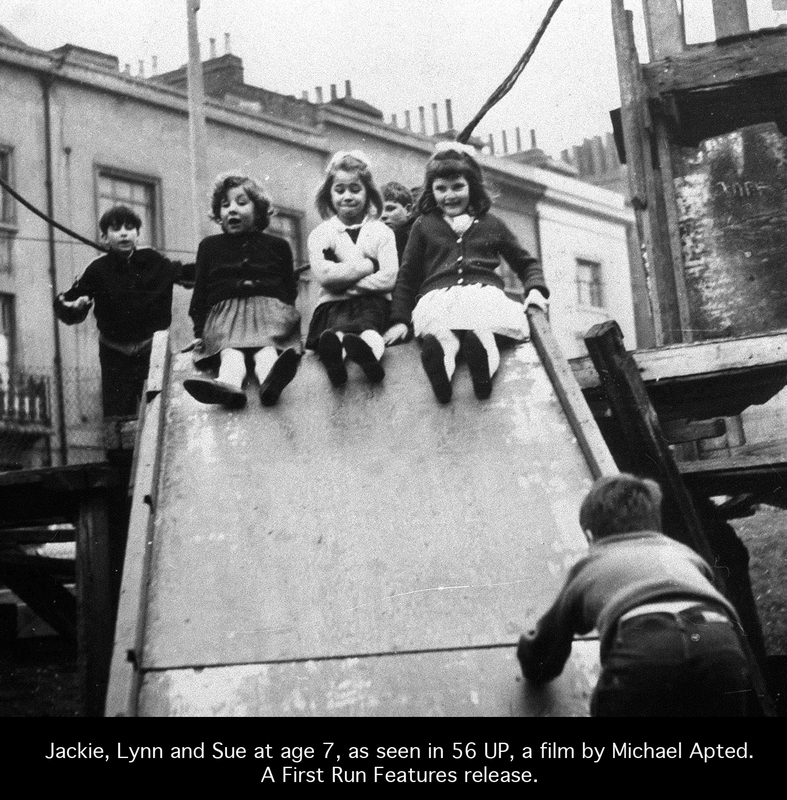 With their whole lives ahead of them, seven-year-old Jackie, Lynn and Sue were featured in SEVEN UP and, in middle-age, in Michael Apted’s 56 UP. A First Run Features release. 56 UP had a critically acclaimed theatrical release in the States earlier this year and debuts tonight on PBS-TV’s POV Indies Showcase (10 p.m. ET, check local listings). I urge anyone with an interest in the evolution of documentary filmmaking and the birth of “reality TV” to tune in. Although previous acquaintance with the subjects would enhance your appreciation of 56 UP, Apted incorporates enough clips from the earlier films to put his subjects’ current stage of life in perspective. For example, I can’t imagine a dry eye in the house during the moving, revelatory flashbacks that juxtapose the challenges faced by these 56 year olds with the hopes and dreams they expressed as innocent seven year olds. POV: 56 UP will be broadcast tonight, October 14, 2013, on PBS at 10:00 p.m. ET. Check local listings. 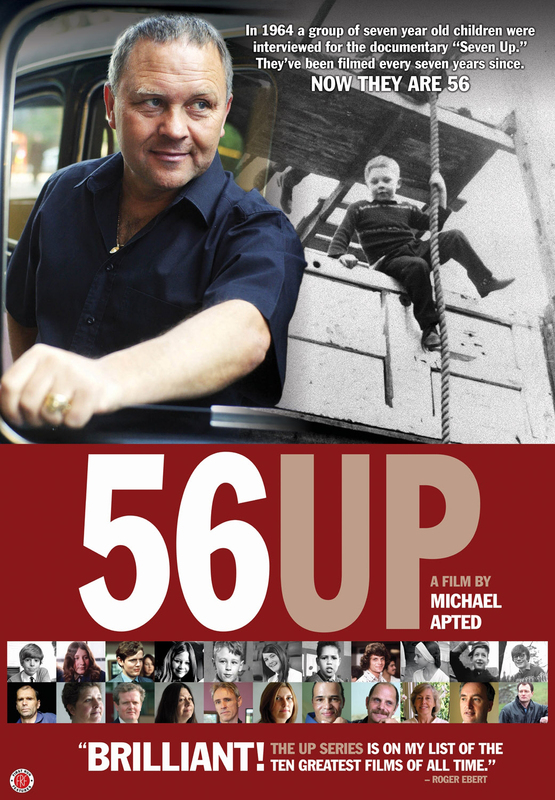 56 UP is also available on DVD, Netflix et al. Be sure to check current availability of other titles in The UP Series as well. This entry was posted in Film, TV and tagged 56 Up, Aging, Family Relationships, Michael Apted, POV, Reality TV, Seven UP, Social Issues, The Up Series. Bookmark the permalink. and observations are so interesting. I love your blog. Thank you, Doris! I make every effort to comment upon media that see life from unique vantage points and also that encourage viewers to take a chance and make a positive difference. I’m so glad to have your support! Judy, I’m so glad for this post. As always, you get to the heart of what’s best out there. I so appreciate what you do. Thank you, Joan! I can’t tell you how much your support encourages me to continue to cover and promote films, TV and, as finances allow, theatre that shine a light on life-affirming issues. I just reread the FAQ section of your beautiful Website @ http://www.joanbauer.com and am inspired to keep writing and building my site. You are a treasure! Thanks for posting this. This is a very important series. Something similar is the film AMERICAN PROMISE, which opens soon in a limited theatrical run and will on Independent Lens next year (February, I think). Filmed over 12+ years, the documentary follows two African-American boys living in Brooklyn as they attend the private Dalton school on the Upper East Side. Filmmakers Joe Brewster and Michele Stephenson are parents of one of the boys. It’s an extraordinary film. Thanks so much for the heads-up, Ted. I’ll definitely make sure to see this film. In reflecting back upon THE UP SERIES, director Michael Apted has said that the imbalance of male to female subjects and minimal racial and ethnic representation disappoints him in retrospect; however, the subjects chosen were of their time and reflected a spectrum of British classes, which was a key focus for comparison and study. The subjects were random and not family members of the filmmakers, which enables a broader, more substantive (less subjective) take on their lives and progression. Since this landmark series has continued for half a century, there probably will never be any films with this particular focus that measure up to its importance… and no filmmakers with this kind of passion willing to devote their entire lives to such a project.